Kvass is considered a native Russian kind of drink, but knew him, and in Eastern countries long before the formation of Russia. 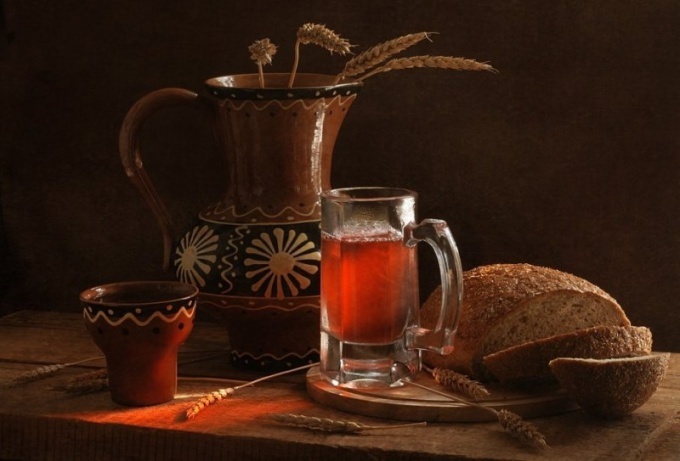 Kvass beverage created through the fermentation of grain material, wort and malt, is popular all over the world, and therefore extremely diverse. Kvas is a popular drink in Russia. It is drunk by both adults and children. It is prepared through fermentation. For this purpose, the yeast, malt or rye bread. This drink is even taking as a basis in cold soup. Brew is probably the best drink on a hot summer day. It is good thirst quencher because it contains acetic acid and lactic acid. Also thanks to the consumption of this healthy drink the body is saturated with the desired nutrients. In addition, the brew is good invigorates, relieves fatigue. But be careful, it contains alcohol. Due to this property of the drink in Russia for a long time was the main intoxicating drink at all celebrations, including weddings. This kind of drink has been around for quite a long time, the first references date to the sixth century BC. Love for the brew has not disappeared today. There are a variety of types of brew. Such as bread, fruit, berries, milk, honey. Kvass from Saskatoon, dogwood, medlar is considered traditional for Uzbekistan, plums, prunes - for Belarus and Ukraine, a drink of the fruit drop, plum and hawthorn, viburnum, juniper do the Northern peoples, including the Finns. Used to drink the cherry, berries crowberry, blueberry, honeysuckle, strawberry, strawberry, bramble, gooseberry, red currant, cloudberry, cherry, cranberry, black currant, raspberry, BlackBerry, cranberries, blueberries, mountain ash. For vegetable kvass using beets, carrots. What it do! And vegetables, and fruit, and bread. Kvass, of course, the most popular. For its preparation is used rye bread, sugar, yeast. Some use different additives, such as raisins, to give this drink a variety of interesting flavours. Kvass not only quenches one's thirst well, but gives at least short-term, but the feeling of fullness and burst of energy, vitality. But the ancestors were held in high esteem Apple kvass. They cut the apples in slices and put them to cook in boiling water was added sugar. When the infusion has cooled down, they put the yeast and left to ferment. It turned out tasty, rich drink. Kvass made from beets. This drink is very beneficial for digestion. For its preparation used beets, rye bread, sugar and salt to taste. Unusual is the brew of lemon, it is quite useful, and the taste is tart with a bitter acidity.